These cookies are so perfect for the holiday season. 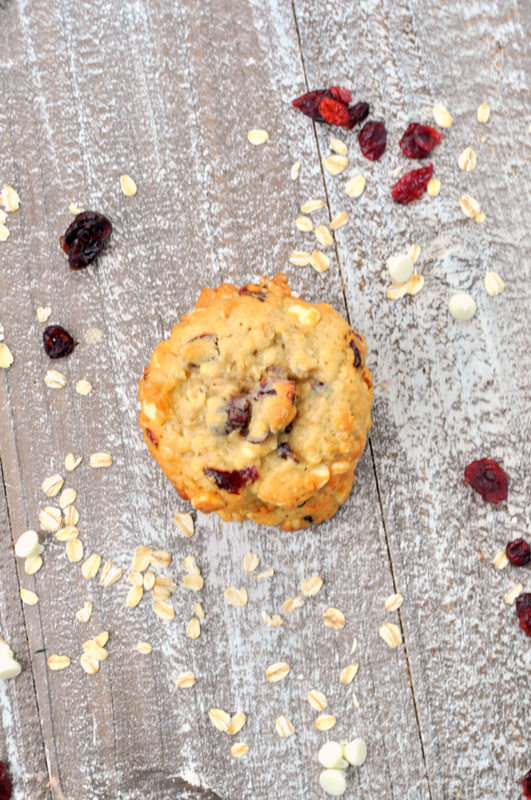 They combine the tartness of cranberries with the sweetness of smooth, white chocolate and heartiness of oats. 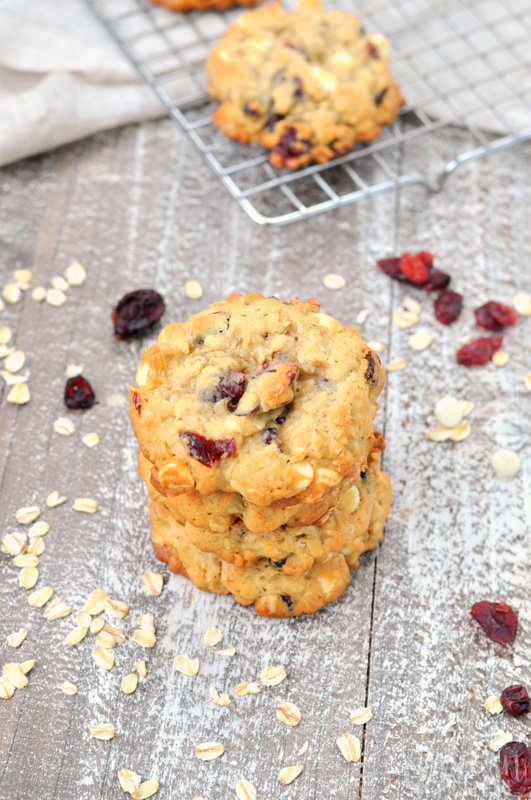 These cookies use old fashioned oats versus quick oats. What is the difference between old fashioned oats and quick oats. Old fashioned oats are rolled whole-grain oat kernels. Quick oats are different because the oat kernel is first cut into smaller pieces before being rolled. This makes it much easier for quick oats to absorb water than an old fashioned oat. You can typically see the difference in size of the oats. Sometimes when I make these, I melt extra white chocolate and drizzle it over top of the oatmeal cranberry cookies. It is delicious but I love them without it too. These cookies practically disappeared as fast as I could get them onto the plate. Mathlete has already requested a second batch and several co-workers want a chance to try them too! 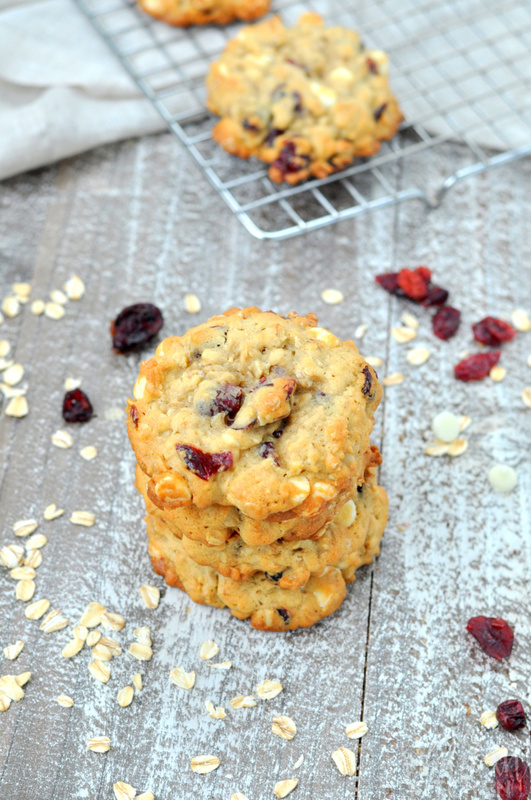 If you make these oatmeal cranberry cookies or any other recipe from the blog, I’d love to hear about your experience. Let me know in the comments or snap a photo and tag it #MySuburbanKitchen on Instagram or Twitter. Preheat oven to 375 degrees. Line baking sheets with parchment paper. Set aside. Beat together butter and brown sugar until smooth. Add in eggs, one at a time. Mix until combine. In a large bowl. combine 1 1/2 cup oats, 1 1/2 cup flour, 1 tsp baking soda and 1 tsp salt. Stir to mix. Gradually add flour mixture into butter mixture. Let each addition incorporate before adding more. 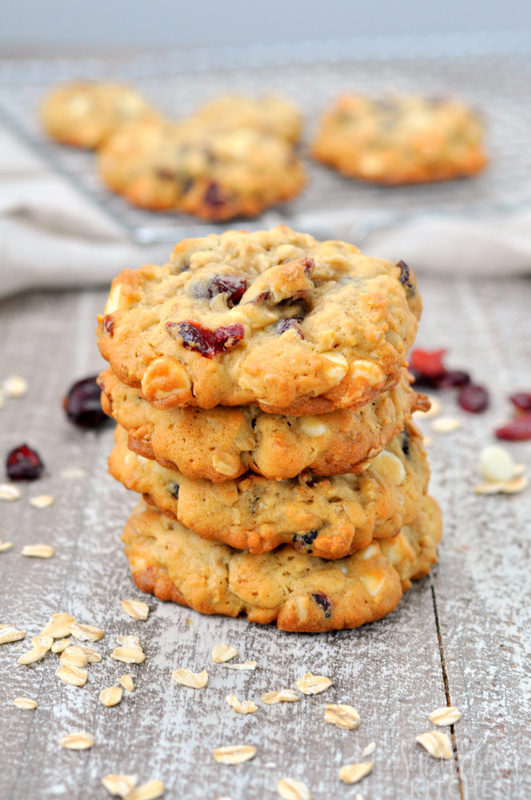 Fold in 2/3 cup cranberries and 2/3 cup white chocolate chips. Drop by 1 Tbsp amounts onto prepared baking sheets. Bake in preheated oven for 8-10 minutes or until lightly golden on top. Let cool for 1 minute on cookie sheet before transferring to wire cooling rack to cool completely. (Optional) In a small bowl, add 1 cup white chocolate chips. Microwave for 1 minute at 50% power. Stir until smooth. Drizzle white chocolate over cooled cookies. These cookies look perfect for the holidays … can’t wait to make them! I’m sure my family is going to enjoy them! We love oatmeal cookies. I just made some the other day but, you really made these look festive. Those look good! I am not a huge white chocolate fan. But for some reason I do like it with Cranberry! Great combo! These are my favorite type of cookies! I call them hootycreeks! Loving these!!! These sound like my kind of cookie! Thanks for sharing!! These look like a great holiday cookie! Quaker Oatmeal is one of my favorite things to cook with during the holidays, and these cookies look amazing! Those look delicious! I do enjoy baking with oatmeal and my youngest son loves oatmeal cookies!! Thanks for the recipe! I LOVE oatmeal cookies so I know these will be amazing! I had a bad outcome today when I made these cookies. The dough seemed really wet, but since I followed the directions I printed out, I proceeded to bake them. They spread out, flattened, and darkened very quickly. I was very disappointed because my cookies usually turn out great and this recipe looked delicious. So I looked back at the recipe online and compared it to the one for printing out, and the amounts of flour and oats are much less for the print out version. No wonder my dough was wet and my cookies were flat! I might try to make them again using the correct amounts, but please fix the amounts on your printer version so nobody else ends up disappointed. Thank you so much for telling me this! I recently switched recipe card programs and I am finding (unfortunately) that some of the recipes didn’t transfer properly. I am going through one by one to fix them. I will fix this one immediately. I do hope you will try again as these cookies are fantastic. I just made 4 batches for our annual bake sale and they disappeared in minutes.